Listen to the podcast. Find it on iTunes/iPod and Podcast.com. Read a full transcript or download a copy. View the blog. As recent outages at Amazon Web Services and Sony PlayStation Network jar the common perception of IT business as usual, IT failures and performance snafus are nothing new, just perhaps much more prominent. These two support stars, Chris Tinker and Greg Tinker, both HP Master Technologists, who happen to be identical twins, were chosen via a recent sweepstakes hosted by HP to identify favorite customer support personnel. Learn here why they gained such recognition, and uncover their recommendations for how IT support should be done better in a rapidly changing era of increasingly hybrid and cloud-modeled computing. 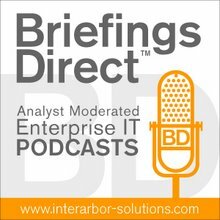 The two were interviewed by BriefingsDirect's Dana Gardner, Principal Analyst at Interarbor Solutions. Greg Tinker: And today the customer expects the technical master technologist, like my brother and I, not just to know the one thing they're asking about, because that question is going to quickly turn. For example, I am having an Oracle performance issue, the customer thinks it may be disk related, but when you dig into it, you find out that it's actually an ODBC call, a networking issue. So, you have to be quite proficient at a multitude of technologies and have a lot of depth and breadth. Gardner: So what does it take to be a good IT support person nowadays? Chris Ti nker: It’s simply not enough to be a technical guru -- not in today's industry. You have to have a good understanding of technology, yes, but you also have to understand the tools and realize that technology is simply a tool for business outcomes. If you're listening to the business, understanding what their concerns and their challenges are, then you can apply that understanding to their technical situation to essentially work for a solution. Greg Tinker: Chris and I study, almost on a daily basis, to stay ahead of the technology curve. Chris and I both do a lot in SCSI I/O control logic, with respect to the kernel structure of HP-UX as well as Linux, which is our playground, if you will. Gardner: Let me congratulate you your award. This was I think a worldwide pool, or at least a very large group of people that you were chosen from. Did this come as a surprise? Greg Tinker: It was an honor, I can say that, and we are very grateful for that. Our customer installed base, as well as our peers and the management team, put our names into this situation. It was a great honor. ... For each vote that was cast, HP donated $10 to the humanitarian organization Care, to max out at a $100,000. They met that goal in just a few days. It was quite astonishing. Chris Tinker: And it was a surprise. ... Very rewarding. Gardner: Okay, you've been at this for 12 and 13 years. What's changed over that period of time? Gardner: You've been describing how things have changed technically. How have things changed in terms of the customer requirements and/or the customer culture? Chris Tinker: The expectation is more for less. They want more computing power. They want more IT for less cost, which I think that’s been true since day one, but today, of course, that "more for less" just means more computing power. The footprint of the servers has changed. Though that model works right for consolidating the cost effort of the infrastructure, so your capital cost is less, the problem now becomes the support model. Customers tend to reduce the support as well, because it's less infrastructure. But, keep in mind, most customers kind of forget a lot of times that they've put all their eggs into the one basket, and that basket needs a lot of protection. Gardner: I'm going to guess that over the past several years in the tradeoff for cost and risk, people probably favor the cost side a bit. So, that means the people in your position are the backstop? Once we ascertain what’s causing that problem and the problem has been defined, we have to figure out what’s going wrong with the technology in order to bring it back online. All that has to be done within four hours on some of our most critical contracts. Gardner: You're sorting through implementations with loads of vendors involved. When it comes to this sort of a mission-critical situation, they're probably thankful that there's someone there trying to corral this. So, I imagine the cooperation is pretty high in these circumstances? So we partner, regardless. As we don’t want to be thrown under the bus, we don’t throw anybody else under the bus. We partner. We come together as one throat to choke or one hand to shake, however you want to look at it. But, essentially, we all have the same thing in common, the customer’s well being. Chris Tinker: We look at IT support as a ladder and we just climbed that ladder. We started in mission-critical support and found it to be exhilarating. With mission-critical support you're talking about enterprise-class corporations. We're not talking about consumer products. We're talking about an entire corporation's business running on an IT solution and how we're engaged in that process. Gardner: There have also been some shifts over the past dozen years or so in the degree to which remote support is possible and your ability to get inside and get that information. Maybe we could take a moment to learn more about what tools have been brought to bear to help you with this? Gardner: While we are on the subject of tools, what's coming next? If I were to design these types of tools, you would be the guys I would go to, to get my list of requirements. What are you asking for? Greg Tinker: The biggest thing we see today is storage. The growth rate of storage is enormous. And the biggest problems customers run into are performance and capacity. Gardner: I wonder if you might have just some last advice for those listening to the podcast as to how they on the consumption side might help folks like you on the services and support delivery side do your job better? What advice do you have for them in order to have a better outcome?